You’ve decided you are ready to open your heart and your home to a new four-legged friend – great! Thank you for considering rehoming from Lothian Cat Rescue. We want to make sure you end up with the right cat for you and we have developed a standardised rehoming process that helps us help you choose a purrfect new companion. Details of each stage of our process are details below. Visit our Cats Needing Homes page to see some of the cats we have with us just now. At any point in time we have up to 100 cats in our care. These cats come in all shapes, sizes and colours. They can range from kittens to 20-year-old senior catizens. Each has a different personality and each has individual requirements. Our shelter rehoming hours are noon ‘til 3.30pm daily, with no appointment necessary. We welcome your visit. We require all (human!) family members who would live with the cat to come to our shelter because it is important for us to see the interactions between each person and the cat. Please be aware that the significant majority of the cats in our care require outside access. If you are looking for an indoor only cat (i.e. one which has no access to a garden at any time) we strongly recommend you call our shelter before your visit, to make sure we have indoor cats with us at that time. On arrival, head to our reception, where we will ask you to complete a questionnaire. This questionnaire helps us guide you to those cats which would be most suitable for you. 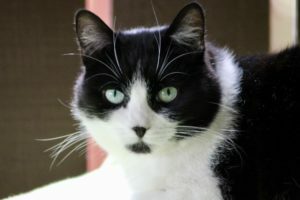 It gives us an insight into your experience of owning cats (some cats have behavioural traits which mean they benefit from experienced owners), who lives in your home (not all cats are happy to live with children, dogs or other cats), your lifestyle (some cats are independent whilst others thrive with company) as well of course as any preferences you may have about your new cat (age, gender, whether you want a cat that goes outside etc). Our experienced rehoming staff will discuss your questionnaire with you, and help you identify which of our cats might be a match for you. We want you to find the right cat, and have years of experience in creating purrfect matches – please trust us to guide you! Please note that we reserve the right to carry out a home visit. The purpose of this is not to be nosey or judgemental, but rather to make sure that the environment you will provide will be safe and suitable for a happy cat. A staff member will take you to meet potentially compatible cats. This is a chance to interact with the cats, and we welcome and encourage you to question us about the cats you meet. They say the cat chooses the person, and hopefully by the end of your visit you will have been chosen. Depending on the cat, it may be possible to leave with the cat at the end of your visit. However choosing a new cat is a big decision and for this reason you can reserve your cat for up to 48 hours. This allows you to ensure your home is ready for the new arrival, and gives you and your family the chance to discuss and be 100% certain that you wish to proceed. There is some paperwork that must be completed before you leave and please be patient as we go through this with you. an adoption agreement – this is a document you take away with you containing important information about your cat. Our staff will talk you through the document, which includes details of their vet check, their parasite treatment record and their microchip number. If your cat has any special requirements or requires any ongoing medication, this will also be detailed on this form. a microchip registration form – this is a document we retain. We will formally register the cat to you 14 days after adoption. Should you wish to change your cats name, please let us know within this period. Once your cat is registered to you, you will receive confirmation of this directly from the microchip database either by email or by post, usually within 6 weeks of adoption. for kittens, we require you to complete a neutering form, which formalises your agreement to neutering the kitten when they become old enough. This is a non-negotiable condition of adopting a kitten from Lothian Cat Rescue. We ask for an adoption donation of up to £100 per cat. The exact donation depends on the age of the cat you have chosen, and goes directly to Lothian Cat Rescue to help care for the cats and kittens still in our care. Our running costs far exceed the level of the adoption donation, but these donations are crucially important in ensuring our work can continue. All cats leaving Lothian Cat Rescue are neutered, microchipped and are up to date with their parasite treatments. They have also all been health-checked by our vet. For kittens, the cost of their neutering at one of our affiliated vets is covered by the adoption donation – we will provide you with a voucher to be handed to the affiliated vet closest to you. We are able to accept cash, cheque and debit/credit cards donations. You can take your new addition home! We understand that adoption day is a big day. It’s exciting and it’s hard to take in everything you are told. So please – don’t panic if you find you have questions you need answering or if you are worried and feel you need guidance. Take a look at our advice on caring for your new cat or kitten. Or contact our shelter – we are always happy to help. We love cats. That goes without saying. Our staff become quite attached to our furry guests whilst they are with us, and whilst we are always thrilled when a cat gets their happy ending, we do miss their furry faces when they leave us! So please stay in touch. We love receiving updates on our cats and feature updates on our Star Cats page here and on Facebook.